Now that we’re a few weeks removed from the New Year, it may be the perfect time to think about trying something new. Pilates gained popularity several years ago but Formula Pilates + Juice has revamped the traditional Pilates studio by adding a juice bar for its members. We sat down with one of the owner, Jasmine Sharp to learn more about the studio. A: Formula is a lifestyle that combines fueling ones’ body with nutrient dense organic cold-pressed juice and keeping it fit by exercising Pilates Reformer machines designed by formula owner. Q: How did your interest in Pilates initially start? A: I was in Real Estate Acquisitions and my lender asked me to join her in a class of a newly opened studio in Palm Springs where I used to live. Needless to say one thing led to another and after assisting in the launch of 8 other studios I finally took the next step in designing my own machine and opening a studio in Seattle then another here in Manhattan Beach. 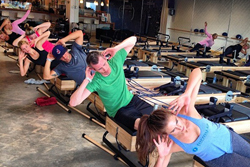 Q: How’d the idea of Pilates and a juice bar get started? A: If you ever have worked with a nutritionist or trainer, they will always tell you “You Can’t Out Train Your Diet.” Fueling the body correctly with high net nutrition is more important than those weekend warriors busting their buns to break even from pizza and beer. We’ve created the formula for you, so you don’t have to guess. A: Educating and healing South Bay residents is what I love most. We have a plethora of highly educated neighbors here in town that value investing in their bodies NOW to prevent disease and high medical bills later. We have a school to career program through Mira Costa that allows us to have a high school intern 2x a year to influence their lives for the better! We believe in a full circle. Q: What are some of the benefits to combining Pilates and juicing? A: As far as at formula, we take the guessing out of the equation, you just show up and we supply the road map, more so the formula! Pilates has countless benefits from rehabilitating injured soldiers to helping pre-post natal clients gain strength, motion and definition. The Juicing has been know to lower high cholesterol, reduce sugar cravings, and aid in preparation and recovery when the body undergoes stress from exercise. A: They don’t. Pilates at formula offers more conservative classes like our “FLOW SLS” (strengthen, lengthen, stretch) that caters to all levels. A: We advised them to start in the FLOW classes named above or suggest a private 1-1 class whereby they receive 100% of our attention. A: Formula has a wonderful client named Sylvia, Sylvia found us one morning by walking her dogs past our studio. Sylvia came to us with knee issues, a weak core and back pain. To date, Sylvia’s knees have more flexibility, she’s lost 6 inches in her core/mid section and her range of motion in her spine has increased significantly…and if I do say so myself she has acquired 10 NEW FRIENDS. Formula offers a culture, a community, a support system and a way of South Bay Life…the formula life. Q: Do you provide any specials for new clients if they want to test out your studio? A: Yes, beginners have 3 options… 1 class for $20 or 5 for $75 or 1-month unlimited for $150. Q: What advice can you give our readers that have always wanted to try Pilates but never gotten around to it? A: Put your workout clothes on and get to formula, that’s really half the battle and REPEAT that indefinitely. You will feel better. This is the only body we have. Q: What’s one thing you’d want everyone to know about Formula Pilates & Juice? A: There’s a good chance you’ll meet lifelong friendships and lose a couple pant sizes in the process. If you're interested in learning more about the studio, you can find more information on the Formula Pilates + Juice website. Know about a local business you'd like Spotlighted on our blog? Leave a comment below or send us a quick email: info@manhattanbeachhomes.com.